Clare was a beautiful Italian noblewoman born at Assisi on July 16, 1194. She was the eldest daughter of Favorino Scifi, Count of Sasso-Rosso, who owned a large palace in Assisi and a castle on the slope of Mount Subasio and who was also a wealthy representative of an ancient Roman family. Clare’s mother was Ortolana, who was a very devout woman who had undertaken pilgrimages to Rome, Santiago de Compostela and the Holy Land. As a little girl, Clare was known by members of her household to be a sensitive little child who is gentle, kind and prayerful. She was known to have a kind heart to the poor that sometimes hide her food from her plate so she can gave it later to them. Then, at the age of 15, she was arrangements to be married to a young and wealthy man, but she refused because she want to get married at the age of 18. In 1211, Clare hear the preaching of Francis at the Lenten Sermon in San Rufino at St. George Church and later meet Francis to discuss her vocation. Francis revealed to Clare the beauties of becoming the Celestial Spouse and the excellence of virginity. Then Francis described to her what he cherished the most in his heart which is the power and the charm of poverty and the need for penance. Clare listened and was enthusiastic. Then the divine appeal touched her very heart. And in a short time her decision was made that she would break all the bounds that linked her to this earth and consecrate herself to God completely. Then Clare laid aside her rich clothes, all her precious jewelry and ornaments while Francis was cutting her long blonde hair and received the rude habit, cord, and humble veil and consecrated herself entirely to God. Acting entirely unconventionally and without Canonical authority, Francis accepted Clare’s bill of divorce from the world and lodged her nearby in a Benedictine nuns near Bastia and was almost pulled out by her father for originally he wanted her to marry. From that moment she vowed to live her life entirely in the service of Jesus, her heavenly spouse. Clare became a follower of Saint Francis of Assisi together with her sister, St. Agnes, who later founded the “Poor Ladies” of San Damiano. San Damiano became the focal point for Clare’s new found religious order, which was known in her lifetime as the “Order of San Damiano”. Then later, Clare’s mother and another sister joined them in the religious community which receives many miracles. Clare lived a rigorously devoted life of prayer, penance, and service. She continually cared for her sisters, particularly the weak, and all those in need. Clare died on August 11th, 1253 of natural causes. 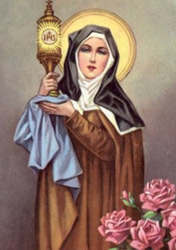 On August 15, 1255, Pope Alexander IV canonized Clare as Saint Clare of Assisi. On February 17, 1958, Pope Pius XII designated her as the patron saint of television. On 1850, The tomb of Saint Clare of Assisi was found and on the 23rd of September in that year the coffin was unearthed and opened, the flesh and clothing of the saint had been reduced to dust, but the skeleton was in a perfect state of preservation. On the 29th of September, 1872, the saint’s bones were transferred, with much pomp, by Archbishop Pecci, afterwards Leo XIII, to the shrine, in the crypt at Santa Chiara, erected to receive them, and where they may now be seen. In 1263, Pope Urban IV officially changed the name of the Order of Poor Ladies to the “Order of Saint Clare”. The name Clare means “Shining” or “Clear”. Saint Clare of Assisi is the Patron of sore eyes and television.